Your child may be ready to start learning piano as early as 3 years! 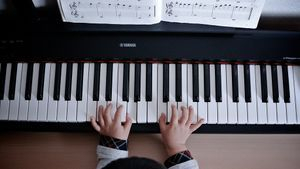 Ask me for a trial lesson - I will give you an honest assessment to their suitability: it may be that two years in school are required before your child develops the focus necessary to enjoy piano lessons at home. "Hi Louise just to tell you that Louis is enjoying the lessons with you and I have seen his interests in sax growing, slowly but growing. He used to be very much into music but had some frustrating experiences; I think you are helping him to get that passion back. You are even drumming with him, this makes you a legend!" "The girls are loving their pieces and practice daily!" "You are the best music teacher Jess has ever had :)"
Each pupil will be taught to read music at sight, to compose, to play by ear, and to freely improvise in a variety of piano styles. Chord charts, aural tests and theory are all covered. I place emphasis on correct learning of scales and technique is constantly developed through fun and imaginative study work. Should you practice between lessons? Everyone is very busy these days! But I recommend a minimum of three quiet practice sessions weekly to make the correct progress. Young children will be encouraged to play for ten minutes, whilst adults may enjoy two daily practices of half an hour, or perhaps even longer if time allows! Practice covers a wide range of activities beginning with scales & warm-up pieces, through the classics, jazz improvisation, songs & folk music to exam work if required. Practice should vary and be fun! Little and often is key to prevent strain. No need for natural talent! Everyone can learn to play piano or keyboard through regular practice using my tailormade teaching system. We always achieve fantastic results! An upright piano, grand piano, digital electric piano or any keyboard will be fine to get started on! Even the tiniest fingers may have a go! (I have previously taught ages 3 to 93). Build your confidence & improve your memory skills! Meet new people! Improve GCSE results! We use a minimum of formal music books and all pupils are encouraged to try composing their own music! Full instruction given in every musical subject. Begin today! You'll love playing piano! Many pupils of all ages enjoy working towards ABRSM piano exams from grade 1-8. Typically you will take two years to achieve your first grade, with further progress approximating one grade per year. Naturally you may progress as slowly or quickly as you wish, but it is vital to fully participate in all musical areas required for the exam: aural tests, scales, sight reading and performance plus improvisation, musicianship in practice, and music theory. Pupils may wish to complement their studies by concert attendance for boosting enthusiasm and enjoying the WOW factor of live music! I can also provide piano accompaniment for ABRSM instrumental grade exams. Louise Woodcock has over 20 years' experience of home piano tuition and live performance plus two studio made CDs. All ages & levels. Lessons in your own home!